Home » Podcasts & Blog » Episode 143 – Be Chief. It’s A Choice, Not a Title! Steve: Welcome to our Becoming Your Best podcast listeners wherever you might be in the world today. 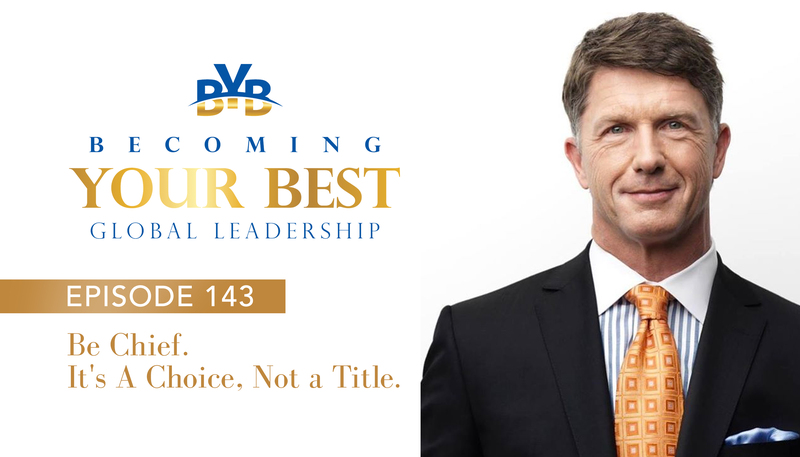 This is your host Steve Shallenberger with Becoming Your Best Global Leadership. We have a fascinating guest today. He is an unconventional turnaround specialist, a servant leader, a go-to chief and we’re going to talk more about that in this podcast of what that means. He is also an experienced and trusted confidant, an author, a sought after speaker and an expert at driving sustainable growth. So welcome Rick Miller. Rick: Great to be with you, Steve. Steve: Well thank you and I’m excited to get right into this. This is going to be a treat for our listeners today. He has such a tremendous background and so I hope he’ll talk about some of the things he’s talked about in his new book Be Chief, especially how he starts it off in Fallujah. If we have time we’ll talk about that. Before we get started, Rick, maybe you could just tell us a little about your background and especially including any turning points in your life that have really had a significant impact on you and where you’re at today. Rick: Sure. Well, as a means of background, it’s always best to start at the beginning. I was blessed to grow up in Massachusetts, in the central part of the state, the oldest of three. My mom unfortunately was hospitalized for a good part of my young life but my dad held it together as really a single parent. But I start there because really everything Steve I’ve done ever since growing up in Massachusetts really is a testimony to my dad. Dad was a personnel guy. They had personnel, as you know, before they talked about human resource people. But dad was a personnel manager in the only non-union manufacturer in central Massachusetts. So I grew up around the kitchen table listening to stories about compensation, and communication and benefits and grievances. You know, connecting management and labor. But the thing that’s I’m so proud I could bust every time I tell the story, I tell it a lot, is that in 27 years at that particular firm, there was never even a union vote when everyone else around the area were union manufacturers. You know, unions are fine, are great things. No question when you need them, but my dad taught me that you really don’t even need someone in between management and labor if you’re doing a good job communicating and caring for each other and doing what you need to build a great and powerful organization. So dad taught me a couple of things which I practice to this day. Number one, if you have a title, you have power. But number two, if you don’t have a title, you have power. Number three, everybody is at their best when they feel powerful. And number four, everybody’s different and makes their own choices. So I learned all about culture growing up and I went on to business school and started my business career. Very interesting I found, along the way, I learned a business school about costs and capital. When I started my sales job I learned about customers and competition. So a lot of things you learn early on. I was also given the opportunity early on in my career, Steve, to be given some real tough assignments. Managers give me, you know, kind of a territory that needed to be turned around or something wasn’t going well. So early in my career, I was kind of thrown into these turnaround situations. Later on, I kind of figured out that I was built for that. So I walked into a situation and have worked along my professional career in anything from a start- you know, I did a startup during the internet bubble and on the other end of the spectrum, I was president of AT&T Global Services. So as they say often, if you’ve got a challenge building a business from zero all the way to 21 billion, I’ve probably worked in that environment and probably led it with a great group of people. So whenever you walk into these business situations, you worry about competition and costs and capital and customers but I always look back to the lessons my dad taught me because it’s all about culture and really understanding that how you treat your people, every single one of them makes a difference. So professionally, I’ve been blessed to have lots of different crazy assignments, as I say, from startup to multinational. But everything that the teams of people that I’ve had the privilege of working with, I have achieved, I frankly go back to that kitchen table in central Massachusetts and lessons from my dad. Steve: What a great background and thank you for taking the time of sharing those with our listeners because how true is that? That our relationships and the strength of our relationships, the levels of trust are really the glue that allow us to excel in a significant way and you were able to observe that firsthand and when people are excited to be at work and they feel like they’re being treated fairly and they have a direction forward, they don’t need a union. Unions do have a purpose. Absolutely. But when there’s high trust, there may be even a more efficient way. So this background was wonderful. One of the things that Rick did was sent me a copy of his book, Be Chief: It’s a Choice, Not a Title. One of the ways he starts off is sharing an experience he had, and this is going to be I think, a good entree into the content. Rick shared a story of something that happened to him in Iraq where he was picked up and what happened. Do you mind sharing that on the air today? Rick: Sure. Well, I’ll give you the highlights because as you read we developed the story quite a bit but for the listeners, it’s true. At the time, I was serving as president of a government unit of a technology firm that had been selected to build out the wireless network that allowed people in Iraq in 2005 to vote for the first time. So my customer was General Petraeus and the U.S. DoD and the Iraqi DoD, the Department of Defense, they were my joint customers. When we first got the engagement, we had a team that was sent over there to do the advance work. Very shortly thereafter, they wanted to see me. I had meetings with the senior government officials and senior military officials to make sure that we were doing everything possible to serve and support our service men and women doing a great job over there. When I arrived at the airport, again, I had this title, I was president. But it was very clear to me that I was not in charge because of the security at the time; flew into Baghdad airport and I was met with a security detail of 11 trained professionals and it was very clear, and I say in the book, the term chief is perhaps a title that people have. I had the title president, but that title didn’t mean anything. The fact of the matter was the people who were in charge, the people who had the power in that situation were the 11 people who were charged with my safety. So as we were driving that very dangerous road from the airport into the green zone, it was clear who was in control, who had the opportunity to show real authority and control the situation and it certainly wasn’t the person with the title. So we spent a successful time in that first trip. We met with the Iraqi minister of the interior and the senior U.S. DoD officials and made sure that everything was going the way it needed to go. But it was just such a clear example that the title in that environment meant absolutely nothing and the clarity and the energy and the confidence of those 11 people who were charged with my care was far more important than any title they held and that’s really the message of the book. Steve: Okay, great. Well, tell us about Be Chief. How did it come about and how can our listeners understand how it impacts them? Rick: Well, that’s great. Great question, Steve. The book is really about power. As I indicated, there’s a belief, there’s a conventional view that power is about authority and control and that that authority and control can come from a title or a position and there’s a kind of a feeling that if you have that title, you’ve got a superiority. In fact, that’s not my definition of power. Power, I believe, comes from the inside of all of us and power is about energy and clarity and confidence and influence and the impact we can have on each other and the organizations we serve. So the book is all about examples of how do we, in fact, how do we measure that power? There’s a survey in the book and actually it’s online in my website that you can get it at bechief.com. It’s free to anyone, to actually go in and measure your power and once you measure it, Steve, you can take steps to increase it. And then frankly, the exciting thing is that when you increase your power, everyone around you has their power affected in a positive way as well. So the book is all about individual power independent of your title or your level or anything like that. For those that do have a position as a manager in an organization, there are things certainly you can do to help your organization help enable those people to be more powerful. But the focus is primarily on us as individuals and how do you make sure you define power the right way, you make choices, simple choices that can make you more powerful and help those around you. Steve: Before this podcast, Rick and I had the opportunity to talk a little bit about Becoming Your Best and really in a sense, this is the building of your own power and as you become your best, what happens, that power and influence increases. It sounds like Rick, what you’re saying is that there’s certain things that you can do that helps you become your best, that gives you this power that allows you to have greater effectiveness, happiness, be more successful in what you’re doing. Do you think that would be the case? Rick: Well, there’s no question about it. I think Steve you’re spot on and fundamentally in knowing the work that you and Rob are doing. You know, I don’t focus on 12 principles although I’m a big fan of yours. The five that I focus on are really going in the exact same direction. It’s how can we make choices to understand that power comes from inside us. Many times when I was going up the corporate ladder, I would wait for somebody else to tell me it was time to get that next promotion, to get, in corporate speak, more power. Realizing that power doesn’t come from a level, it doesn’t come from a title, it doesn’t come from anyone else. One of my favorite quotes is “power is never given, it’s only taken”. So what choices can we make as individuals to take it and be our best. Steve: Okay. Yeah, that’s great. In your book you talk about building a compass, which helps us go in the right direction of course, and that there were certain components of that compass. I think these are the type of things you’re talking about now that help build this power within us, that’s innate in us, that flows outward, that causes radiation, this energy to take place. Would you mind talking about a few of those components that helps us build a compass, that helps us create this confidence and leadership within ourselves that allows us to be successful in every area of our life. Rick: Happy to. At its core, Steve. The compass is about connecting what you do to who you are. At the core. That’s really what the compass is about. I have many years used the analogy of a roadmap. The challenge with a roadmap is it gives you different directions to get from Point A to Point B, but clearly if you’re on a road, somebody has gone on that path before, right? They’ve laid the groundwork. They’ve laid the road that you’re now traveling. Many people these days, don’t want to go where somebody else has gone before. They want to go to a new place in a new way. So I love the analogy of the compass, because the compass can set you in a direction. If you want to go north northwest, they might not be a road paved in that way. So you define what you want to do and how you want to do it, but you connect the two. So to get specific, what to do? I’m a big advocate of discipline and supporting other people. And in the survey that again, free to all of your listeners to go on bechief.com and take this simple survey, you can actually measure how disciplined you are and how supportive you are of others. That’s kind of the what you do. It’s connected to who you are. Who you are is all about your insight, your self-understanding and your values. And if you understand, you connect your insight and your values to your discipline and how you support others, you can be massively creative. Now, creativity, we spend some time talking about because creativity is not what an artist…We might think of an artist who is a creative person. When I use the term creativity, I use it as a synonym for you create, as in you manifest the future, you create your future. And you create it powerfully when you connect what you do to who you are. So how do you do that? There’s a couple of different parts of creativity. There’s internal creativity, being aware of how you’re feeling and how you’re thinking, which is really the beginning of the creative process. Then there’s the external creativity. Everyone knows you create when you act but you also create when you speak and when you write. The power, Steve, comes when you align all five of those. You align your feelings with your thinking, with your speaking, your writing and your acting and you take the energy, the power that comes from that, that alignment. People know that you can lose power very quickly with other people by saying one thing and doing another, right? That doesn’t work. But for you yourself, if you know what you stand for and you can take actions and speak and write in ways that are consistent with your voice inside, it really does create incredible energy and by the way it spreads and that’s what’s fantastic. Steve: Well, I love that use of creativity, of really connecting the things that you do with who you are. I guess I’ve never really thought of it that way. So is this kind of a continual process, Rick? Steve: How does this work? Because I mean, think about this application, often we hear about the word creativity and we’re thinking about solving a problem or directing it in one way or another, but you’re really talking about, if I get it right and help me be sure I’ve got it, you’re saying, we’re going to use this creativity to bring all these things together of how we feel, think, speak, write and act based on who we are to get great results. Is that what you’re saying? Rick: Absolutely, right. And I’ll translate it for some of your listeners who I know are in business. I am from a professional standpoint, I’m a turnaround specialist. So I get pulled into organizations that are in pretty deep yogurt and they need help to get out of it. And so yeah, we work on customer issues and cost and capital and competitor issues, but really unlocking the potential of the people, the power of the organization which many people just don’t focus on. Right? That’s where the sustainable growth…You talk about sustainable success and the great work you do. I talk about sustainable growth because it’s not just good enough to turn around an organization performing poorly to perform…You know, Good To Great is a fantastic book, Jim Collins wrote. But this is about going sometimes when it’s not so good, how do you get to great and then how do you stay there? You stay there with an investment in your people. Going back to what dad taught me. Steve: All right, well that’s great. Now, you have also talked about support. How does that fit in the compass? Rick: Well, support is critical, because we talked about chiefs is a term I use. Chiefs, many times have people who support them. But we learn is that support is actually…The more support you are given is in direct relationship to the more support you give. So when you are enabling other people, when you’re supporting other people, when you’re encouraging other people, when you are modeling the kind of activity that you’d like others to offer, when you’re questioning people to help them grow in a way that you know you can help them grow, when you’re inspiring them, the more support that you give other people, the more support you will get. It sounds so simple Steve, but I know in your work in your research, it doesn’t always happen. Steve: Right. And so as you were talking about this and your dad that message of relationships, I’m just thinking, now I’m starting to see the vision of what you’re writing about is that there are certain things we can do such as building these relationships by offering support to others which brings out the best within them and maybe even within us in the process. Rick: No doubt, no doubt. Again, in your kind intro, you know, you talked about a turnaround specialist, unconventional and a servant leader. I mean this is fundamental to the work. I think we both do. This is this is our opportunity to serve and it comes back in 10x kind of ways, but this is a service orientation without a question. Steve: Right. Now, let’s build on this turn around experience that you’ve had. By the way, I had an early mentor and that’s one of the things that inspired me to get into business, is that what he did is he’d take over broken organizations, something that wasn’t working, and it was actually going backwards. And on his business card, he was a certified international consultant, but he had also run businesses. It had the words “Accomplishing the Seemingly Impossible.” I love that. What a mindset. I mean, you know, it’s great. So this is a process of being able to come in and turn something around. My guess is that every one of us that’s listening today, me included, are faced with challenges every single day of taking things that may be going sideward sometimes and getting them going in the right direction so that it is aligned to be successful. So what are some of the key components that you’ve observed that need to be in place to do a turnaround, to get, you know, things going in the right direction? Rick: Well, again, the strategy that I always talk about is, I call it a 6 C strategy. Again, you’re going to turn around anything. It is about customers and competitors and costs and capital and community, but it’s about culture. But I want to, specifically for your listeners, I’ll give you something that I think is just critical. Turnarounds require an incredible amount of energy. You can’t walk into these situations when things are really bad. When I show up, things are generally bad and people need the energy to persevere, the energy to build optimism. I’m such a believer that energy really does come from the inside. So the tip that I would offer, since you asked for a tip, was to understand that when things are at their craziest, you need to take time to be still. When all the voices are coming at you from customers and employees and competitors and you’re in a leadership position potentially, you’ve got to find some time to still your mind and be clear about the voice that’s inside you, inside all of us. That stillness is sometimes something that we don’t take advantage of. So the energy that comes from, what I believe is insight, comes from finding that time to be still and also to be present. To make sure that you’re getting the most out of every situation and every relationship by being totally where you are at that moment. When you’re speaking to any individual, you shouldn’t be thinking about the vacation that’s two weeks away or the meeting that you just walked out of. You know, the incredible gift of being present combined with being still leads to the kind of energy that you really have to focus on to work through turnarounds which otherwise could be completely draining. You talk about an impossible mission. You know, the phrase you just use. Doing the impossible. Well, doing the impossible means you’re climbing a hill that other people would say, “I’m not even going to try.” And that energy certainly can come from other people, but you have to make sure that you’re doing what you can to build it in yourself. Steve: Right and Rick, when have you found is the best time to do that? You know, to really still yourself and to listen. Rick: It depends. I can tell you that when I was in the green zone, because trying to stay quiet there was tough. We literally, without exaggeration, had mortar fire and took incoming at certain points. But I would tell you that before the day started, I would create some time to meditate and to pray. So for me, that was the time that I needed to settle myself and I would find that during the day, I might need to take a quick one minute break when things were kind of going crazy. To find time to just a center myself and bring myself back because with that level of intensity and people describe, you know, business sometimes as war, it’s not. It’s clearly not. So even in the intensity of a true war environment, the criticality of tending to stillness I think is important. My favorite time is first thing in the morning. I’m a morning person. I will stop during the day but that morning, if I can get 10 minutes, I take it and I’m grateful for it. Steve: That’s awesome. And when you feel settled, talk about power. That’s powerful. Rick: It is, particularly in an environment where you’ve got even well intentioned friends family who are already all always willing to give you an opinion. And I was going to say, the well intentioned media but I’m not unsure the media is well intentioned. They just want to keep your hooked, social media included. So yeah, it’s more and more difficult to do, but I think more and more critical to do, Steve. Steve: Okay, good. Well, that’s worth our podcast today. If each of us could have the habit of settling ourselves regularly, being at peace, and giving ourselves perspective and internal strength, we’re much more effective when we do that. So thank you. That’s a great tip. And then before we end up today, in Rick’s book, he talks about building this compass and these different components. We’ve talked about some of these, the values that we have within our center, if you will, and being able to use creativity and focus so that we’re going in the right direction. I love that idea. And then we’ve talked about support. So we’re building other individuals as we work with them whether we have the title or not to get results. There were a couple of others I noticed. One was insights and the last one was discipline. Rick: Yeah, we talked a little bit about insight in terms of the energy about being still. That develops the insight or self-understanding that’s key. Discipline, I think is something that really…Well, a lot of people are familiar with discipline. My strong belief and experience would lend credence to this, has an awful lot to do with the clarity which many people thirst for, right? People would love to just be clear and there’s a wonderful benefit about simplistically, you know, planning the work and then working the plan and then adjusting along the way. So the principles of discipline are not breakthrough. This is not material that doesn’t exist anywhere else. In fact, the whole book is not meant to offer things that have never been thought about before. But you’ve been through it Steve. You know that this very small book is really a synthesis piece. It’s really a synthesis of a lot of great work and I give great credit to many great writers and researchers who are included in the book. But it’s about two words. There’s a great supply of leadership information out there. What the book attempts to do actually is help readers apply it. So I can read book after book after book, but where can I go to the book that will say, wow, this is going to help me use it. This is going to help me apply it in my work, in my life, with my family, with my relationships. That’s what this very small book is about. So the apply side is something I really focused on. Steve: Okay, well, this has been fun talking with you about the book because having read it, the things that you’ve pointed out are just driven a lot deeper and more clear and I’m seeing how they come together. So for example on being still, where you reflect upon your gratitude and the blessings that you have. So powerful. That grows that. But then this discipline, although they are the nuts and bolts, Rick, I don’t know what you’ve seen out there, but I’ve seen a lot of people that don’t do this and your description of having the discipline for having a clear vision and a strategy and tactics are critical to realizing success. So this is a tremendous model that you have put together. I love it. I can’t wait to take the test. Rick: Great. Well, again, just to be clear to all your listeners, I’m excited about the book, I hope people will consider the book. Just to be clear, all author proceeds from the book are going to a great charity Sammys House down in Austin, Texas. So all author proceeds are going to Sammys House. So I hope everybody buys books for that reason, because Sammys could use it but for those that want to kind of put their toe in first, go to bechief.com and take the survey. Build your own compass for free. Absolutely free. It’ll take you five minutes and it’ll give you a view into something that we think can help you be more powerful. Steve: Good. Now what Sammys House? Rick: Sammys House is a just a wonderful facility in Austin, Texas. I always make the analogy of other great work done at St. Jude’s where they focus in one facility primarily on obliterating cancer. And at Sammys House, they’re really focused on kids with pretty significant special needs. They’re not focused on one particular disease state, but Isabel Huerta, the founder of Sammys House has been around for 20 years has done a wonderful job in the community establishing a place for kids from infants through 12-year-olds and parental support when kids who deal with one and two and three levels of disability. It’s not just one, but the combination of two or three things that they have to deal with, create a really unique opportunity for them to learn in a different way. I was there last week and it’s amazing because I went down there to serve and I was served and being inspired by these amazing kids and the amazing staff there. I don’t know, Steve, whether you saw the TED talk that I did on power. I told a story in the TED Talk about a wonderful six-year-old with cerebral palsy who ended up being one of my greatest teachers. I was there to serve her and she taught me more than I ever thought possible. So whenever you’re there to serve, it’s kind of the generosity gratitude thing. You think you’re there to be generous and really you’re there to be grateful for the wonderful gifts that these amazing kids can share? Steve: Well, great. Well, that’s wonderful and you’re doing so many great things and that’s a that’s a blessing for many people. Now, before we wrap up, any final tips you’d like to leave with our listeners today? Steve: And don’t sell yourself short, right? Steve: It’s been great. Alright, so one last time. How can people find out about what you’re doing? I can tell them, I’ve heard it a few times but go ahead. Rick: Great. The easiest way is to go online at Bechief, B-E-C-H-I-E-F.com, you’ll be able to download a chapter of the book, you’ll be able to take the survey, you’ll be able to check out some of the reviews of what’s happening and you’ll get to learn more about Sammy’s House all at bechief.com. Very grateful Steve to you and your listeners for the time today. Thank you so much. Steve: You bet. Well, thank you Rick Miller for being a part of this show today. What an amazing time we’ve had. We wish each of you who are listening with us today, the best as you are making a difference in the world every single day. And this is Steve Shallenberger wishing you a great day with Becoming Your Best Global Leadership.